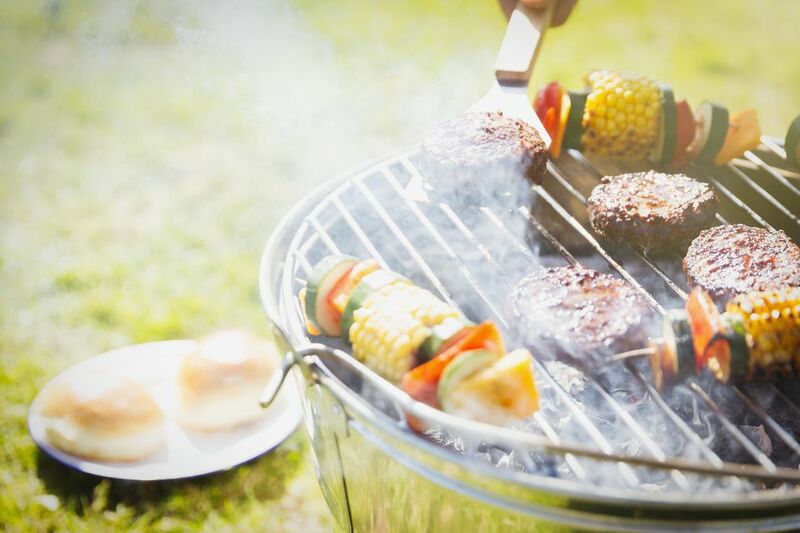 Custom built barbecues were made popular back in the fifties, before mass-produced gas and charcoal grills took over the market, but people have become increasingly interested in building barbecues of their own. Before buying lumber and cement, you need a good idea of what you want in a backyard cooker. You can build a simple grill or a combination grill and smoker. Do you want something that's little more than a fire pit or do you want a fully functional gas grill that would put to shame any standalone on the market? Part of this decision should be based on cost; you can construct an attractive fire pit with a few metal poles to support a cooking grate for less than it would cost to build a gas or electric grill with convection fans, multiple burners and storage cabinets. A simple charcoal or wood-fired barbecue isn't that complex. Find a place for the fire that is well-ventilated, away from other structures, and add a cooking grate to put the food on. This kind of grill can be constructed from bricks with a little know-how, a masonry book from the library and some pre-made metal parts. You could put it together on a Saturday afternoon with a friend or two and a good supply of refreshments. If you want to go with a gas grill setup, though, you may want to purchase a gas grill insert built for outdoor use. You can find these in many stores or order them online. They will probably come with plans to help you put it together. The gas grill inserts usually come in drop-in or slide-in models. This requires a pretty simple structure to hold the grill in place. Placement: Put your barbecue where it won't put other structures in danger from fire and where it can stay for many years to come. Consider where the smoke will go so it doesn't interfere with seating areas of draft into the house. Appearance: Follow the design of house and yard so your barbecue won't seem out of place and will fit into its surroundings. Match brickwork, masonry and colors to allow the structure to blend in. Utility: Make your barbecue more than a barbecue. A well-designed barbecue will do more than cook food. Plan on being able to use your outdoor kitchen storage and table space year-round. Weather: Build your barbecue to withstand the elements particular to your part of the world. You want your barbecue to last, so a good enclosure is a must. Consult with local building experts to choose the right kind of stone, brick and other materials that can take your climate's punishments. Maintenance: Design your barbecue to make it easy to clean and repair. You don't want to find out later that you need to cut through stone or bricks to replace a part. Remember that gas grill inserts do not have standard measurements, so they cannot be easily swapped without making major alterations to a grill island or other type of structure.